I took a trip to Holmes County last Friday with fellow photographers and visited the Mt. Hope Auction which was holding an Antique Engine show. It was like stepping back in time as the many tractors belched deep dark smoke from their coal fired engines and powered everything from sawmills to dynamometers. The first photo above reminded me of the old photos from the Farm Security Administration of the Dust Bowl days and I did quite a bit of post processing to give it that kind of look. 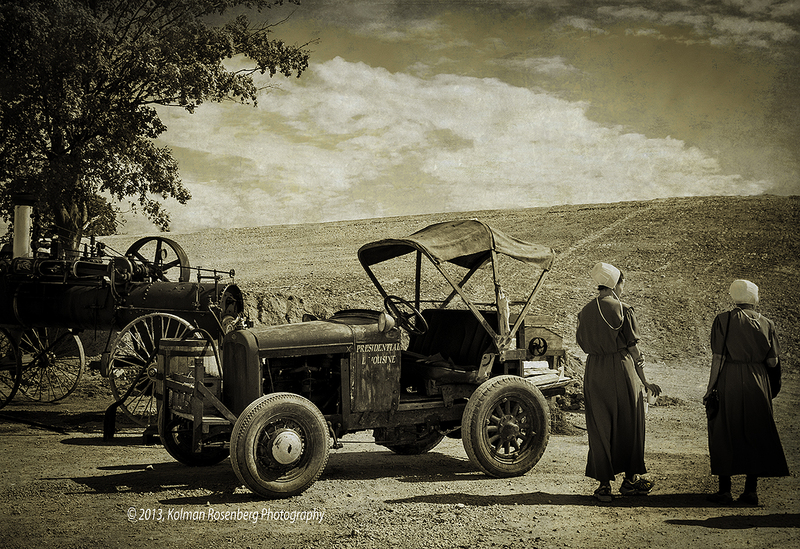 The Amish ladies and the old Chevy and steam tractor to the left look like a photo from yesteryear. 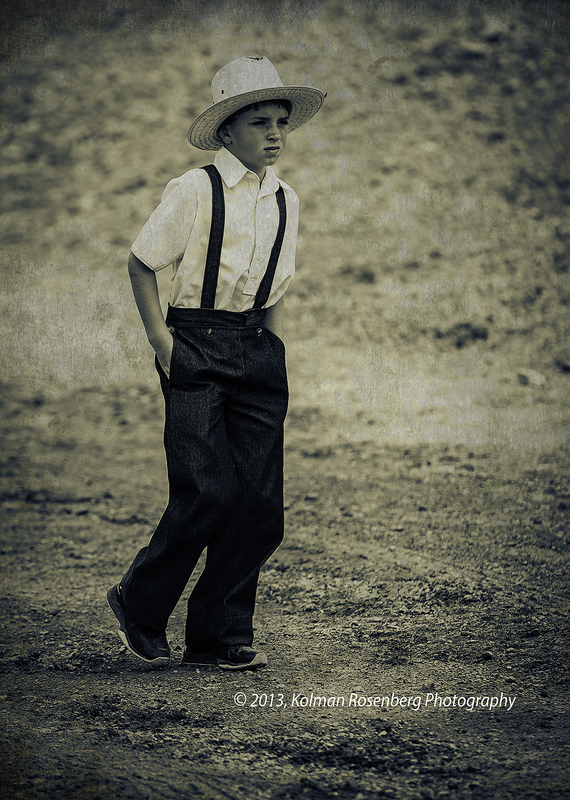 The Amish boy, walking up a stone pathway also seemed to take me back in time. The event itself also included contests of skill including hay bale throwing, wrench throwing and skillet throwing! It was a fun day and I’ll surely go back another time! This entry was posted in Uncategorized and tagged amish, chevy, dustbowl, Engine, holmes county, OH, ohio, sawmill, Steam, Tractor. Bookmark the permalink. Wonderful, I love what you did with these. I live near an Amish community and I always feel as is I have stepped way back in time when I drive through there. Do you have thoughts about taking their photographs? I am under the impression that they do not want their photographs taken, yet they are out in “public” like the rest of us. Thanks Patricia! Yes, I do hesitate usually to take photos of the Amish. I’ve not taken many shots that I thought would be wonderful in the past! At this event, there seemed to be many photographers and I won’t deny that I went with all intentions of taking photos. Most of the Amish did not seem to mind and even smiled on a few occasions. Others turned their backs, which I took to mean they didn’t want their photos taken. I did take a few shots of the engines and tractors with them in the picture and their backs turned. I’ve found that local communities have different views on this and in fact one Amish Establishment in Cherry Valley, in Ashtabula County, once lined their kids up for pictures for a tour bus that stopped in while I was there shopping! It is always a moral dilemma for me, but the Amish seem to be becoming more liberal all the time, at least on some issues! Thanks Bob! Modern shoes have stood out in a number of my photos! It bothers me but it is reality! I’m becoming more artistic/creative though these days, so it’s just a matter of time before I make some post processing changes. In the top photo I did burn in the shoes to make them a little less obvious! Both photos very nice. I think you are right. The first one is definitely one your best. Would love to have a copy of that. Bravo, well done! Thanks Lin! I may have to go back down there soon to get some more shots! I didn’t do any landscapes but they were there to be had!